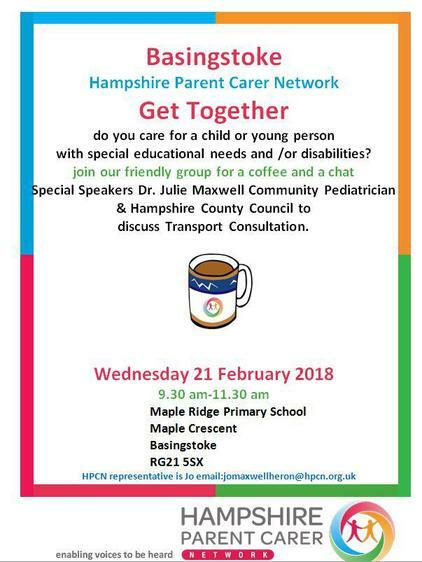 As you may know, we regularly host the Hampshire Parent Carer Network coffee mornings here at Maple Ridge School, one morning a month. Please see attached the details of the upcoming session, where members of the local council will be in attendance to answer any questions about the proposed changes to Home School Transport. As well as Dr Julie Maxwell a community paediatrician. If you would like to attend please arrive any time between 9:30am and 11am on 21st February 2018. The session is held in Cedar Room and welcomes everyone, the more the merrier!